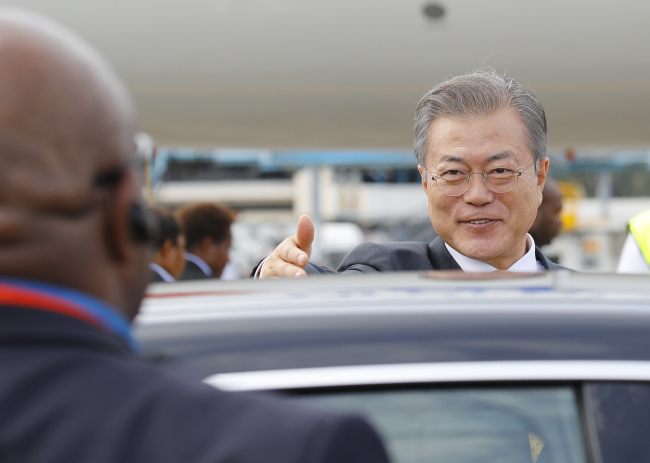 President Moon Jae-in returned home Sunday after attending this year's Asia Pacific Economic Cooperation forum. Moon's tour began Tuesday with a four-day trip to Singapore for annual regional summits, during which time Moon also held bilateral meetings on the sidelines with Russian President Vladimir Putin and US Vice President Mike Pence. North Korea was a key topic for both meetings. He then left for Papua New Guinea, where he met his Chinese counterpart, Xi Jinping, to discuss peace efforts on the Korean Peninsula and other issues. It was their fourth meeting since Moon took office last year. They last met in December, when Moon made a state visit to China.